It's an inspiring thing to see popular power at work. To see the people assembling, moving through the streets, excited, with bubbles of jubilance, chanting, singing, carrying signs and banners – and then acting. This just happened again in Madrid. There was a demonstration last Saturday, 6th of May, “Madrid no se vende” – Madrid is not for sale. I've been working on the theme of gentrification for a show in Berlin, so of course I had to go to this manifestation of the resistance in my city. The “mani” assembled in a tight little plaza not far distant from the Puerta del Sol, epicenter of touristic Madrid. 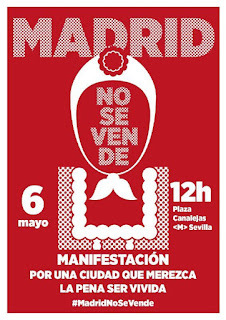 “Maybe it's only a concentracion, not a manifestacion,” my partner suggested. Perhaps there won't be so many people. But as the noon hour approached, the crowd began to build, hundreds filling all four corners of the plaza. The police – national in this case, who control civil demonstrations – closed the streets, and the marchers set off down a quaint old street lined with touristic shops. These aren't crappy places, but nicely done, reeking of authenticity, and sprinkled with genuine old businesses. By now I was beginning to wonder a bit that the “mani” did not seem so very focussed on the questions around touristic gentrification. No denunciations of Air BnB. Rather it was a crowd of folks representing their affiliations. There was the PAH, the famous housing rights activists and campaigners, in their green vests and t-shirts. Everywhere folks were wearing “No se vende” neckerchiefs. (I gotta get one.) Many bicyclists, some with “bicycle life” t-shirts. “Open the borders” shoulder bags. A group of Africans with a banner and signs, “right to papers” (“papeles por derecho”). “#stop buitres”, the “vulture capital” firms that have been buying up public housing from the previous city council. 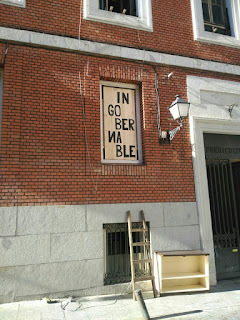 “Por un Madrid respirable”, a Madrid you can breathe, anti-smog, probably Ecologists in Action. A woman wearing a placard advertising for a place to rent! Folks wearing t-shirts of their barrios – Carabanchel, Arganzuela, and the ever-radical Vallekas. Radio El Salto is doing interviews. (El Salto is a new media project, a consolidation of two other left outlets.) Men wearing “castizo” hats. I didn't see the Yayoflautas “in uniform,” but there were plenty of older folks like me there. Everyone led by a sound truck plastered with posters and banging out dance music. At the hour mark, I left them marching down calle Atocha, and headed home to make lunch. 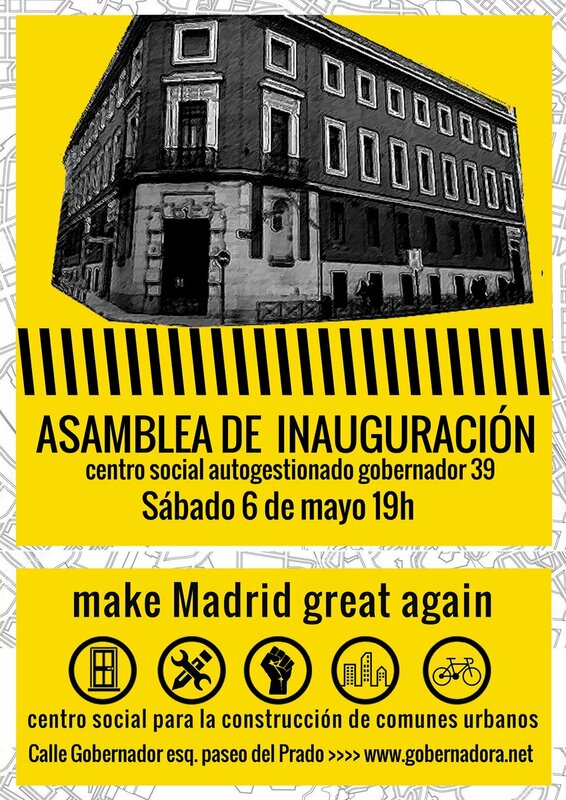 To my surprise and delight, I learned on Monday that the crowd of the “Madrid no se vende” demonstration had supported the taking of a building in the very heart of the city, across the street from the Prado Museum. An ancient heritage building, formerly a university, then a health clinic, now – la Ingobernable, the Ungovernable social center. 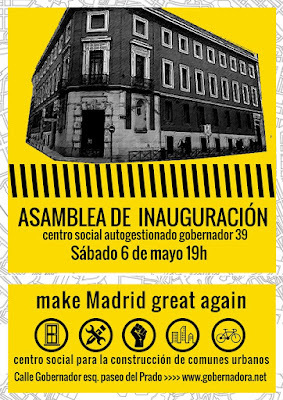 This action expresses the frustration that many social movements have with the recently elected city government, Ahora Madrid. After long years of right-wing rule, the new council has been slow to realize change. Their motions have been fitful, and much of their energy consumed with internal strife. After a year away from Madrid, I had expected to return to something politically exciting. I left just after Ahora Madrid was elected, so I looked forward to new cultural opportunities, and a blossoming of citizens' initiatives supported by the city council. That isn't the case. They are working, and there are signs of it, but it's all been quite sluggish and unspectacular. Meanwhile, business as usual marches on, and the big news is the corruption of the previous administration, not the initiatives of the new one. The public art agency of the council, Intermediae, has commissioned architects to make maps of citizen services and projects in the barrios outside the center. These projects are useful, no doubt. And the groups of architects involved – Basurama, Zuloark, and Todo por la Praxis – are skillful and ingenious. But they haven't ramped up at all since the election, and so far as the social movements are concerned, this is pretty small beans. The systemic problems of the city to be confronted, baked in by years of insider governance and corruption, are much greater. At a meeting in January, a packed house of squatting movement(s) activists complained of the indifference of the city government to their claims. Patio Maravillas, the thrice-evicted now homeless social center, complained that it was impossible to open any place in the center of the city, only in the peripheral barrios. EVA Arganzuela begged for participation. I later walked around this giant popular market, now shuttered with weeds growing out of it, and wondered what happened to the surge of people who stopped its development as a riverside shopping mall. The citizens of the barrio “won,” but now everything is frozen, on hold, awaiting a normalized process of development. So clearly a great sense of frustration with the pace of change, and the opportunities the new city council has not offered to citizens' initiatives, lies behind the new Ingobernable. Now frustration has turned into action. The social center is “something material and positive. To open a social center is to create a living space... a reality that does not wait for the administration, which in fact does not need it at all. It is civil society at its best.” It gives a new job to an abandoned facility, “taking advantage of a social wealth” that has only been used for speculation or corruption. The building occupied by the activists is an old one, a heritage building. Owned by the city, it was given to an architect by the former mayor so that he might make a museum in it – that is, it was removed from its public uses (as university and then health center) and placed in line to the realm of touristic spectacle. But nothing can ever be so simple as the rhetoric of action proposes. The architect in question, Emilio Ambasz, is a pioneer green architect, praised by urban visionary Michael Sorkin. Sorkin's students worked on green design for a South Bronx okupa in the 1990s. In my ideal world, Ambasz would visit Ingobernable, then, with city council support, work with the architectural collectives Intermediae has already contracted to produce a truly dynamic, continually evolving “museum” of the architecture of civic participation. This is what Ingobernable proposes to do by themselves. We'll see if governance itself up to the challenge. (Público, formerly a print daily, is now online; best consistent coverage of social center occupations after 15M monthly paper itself. 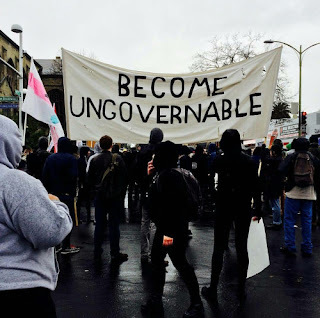 "Ungovernability" -- it's not just for riots anymore!